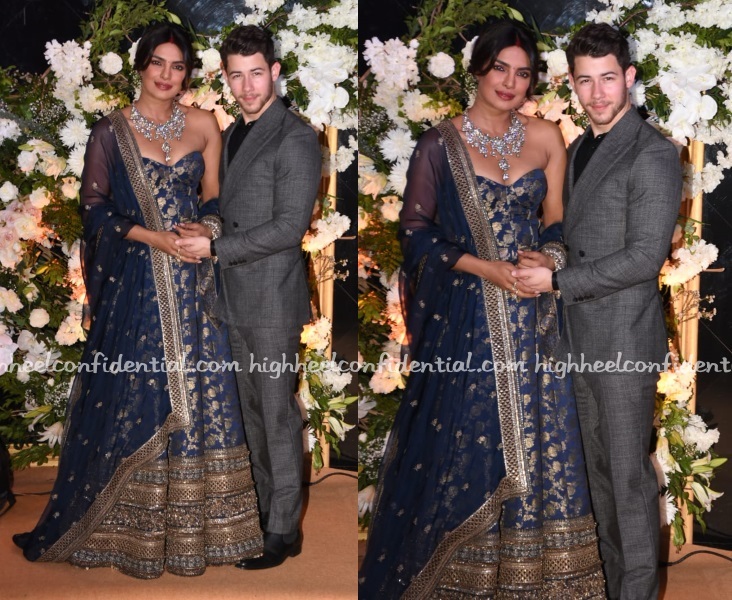 Priyanka and Nick are having their wedding reception in Mumbai tonight (one of two) and the bride was seen wearing a brocade strapless Sabyasachi anarkali paired with diamond jewellery. Nick kept it simple wearing a grey suit with a black shirt. The necklace and the hair style are not great. Nick could have worn a sherwani to complement Priyanka’s attire. No :(. This is so sad and unremarkable. The color, the silhouette, the weird pattern — everything’s so tired and so dated and looks so pedestrian. And the jewelry? I have no idea how anyone can make $$$$$ worth of diamonds look this terrible. And that hair situation: it looks like Priyanka can tell it’s a sad, bad outfit, too. ….I didn’t even notice Nick was wearing an equally unremarkable grey suit with —ew — a black shirt. Wtf, did their private jet lose these guys’ luggage or something? And then they had to go urgently shop in Paharganj in 1994? The jewellery is clashing with the gold in the outfit. A big miss. I’m so confused? So it’s a requirement that EVERY SINGLE bride, bollywood and rich HAS to wear Sabyaschi? Like someone said in a post yesterday.. .Bollywood should rename weddings to ‘Sabyasachi’ ..as in “we are getting Sabyasachied on this date”. I really wish her hair down in a half up half down hair style. No just no.. This look ages her!! this is so atrociously bad! let’s see. 1. dupatta with the strapless situation isn’t quite going together. too disconnected. 2. that necklace is probably the GDP of a country, but looks super tacky and clashes with the gold in the anarkali/gown. 3. hairstyle is horribly dated. 4. girls look squished + underarm cleavage. 5. the Sabya outfit itself is pretty bad — not sure if poor lighting, but does not look like a piece of art that Sabya’s creations usually look like. So disappointed in this. unfortunate. Has anyone told her that the bindi is for the forehead and not the nose? It seems to be getting vexingly lower each time. Omg yes !!! I’m trying to push it up through my phone screen. Urgh ! Hahaha. I read your comment and thought ‘oh! she’s stuck a bindi on her nose as a nose ring?! Then went back to look at the photos. I want to use that emoji with tears of laughter. The moment I looked at it, it reminded me of a cheap sand washed denim corset dress. Really tacky. Train wreck. She could have worn a sleek gown for the reception and ditched Bollywood’s masterji for once. Instead she chooses the most OTT Lehenga and jewelry. And him, well meh. I had such high expectation!! This is such a downer in each and every segment. After all the great outfit she wore so far (with a exception of red gown) I was hopeful that her reception style will be a breath of fresh air after all the Sabyasachi overdose. I am done with fashion blog for today, I will go and sulk somewhere. Looks like her PR team could not publicize this reception to garner enough attention. That probably explains the mediocre styling. For someone who claimed that she wanted to be a princess at her wedding (which she kinda did with the 75 feet trail), she short changed herself for the reception by using one of her costumes from 2005. The comments are so funny! Their Bollywood reception is tomorrow. Today was just a lowkey one for her employees and family friends. People need to relax! Those diamonds are anything but low-key. Sure whatever, low key or not, who stopped her from getting a well tailored and properly fitted top? What does that have to do with turning up dressed badly? Employees and family friends are stuck in the 70s and 80s that she has to appear so dated in every way possible? Strapless, the dated design and weird hair.. All elements make for a very ordinary and dated look.. Whether we liked Deepika’s looks or not fosomething her receptions, she managed to turn some heads and take notice. PC has failed to do that with any of her looks. Since the day of the wedding till this reception. This look is just atrocious! Deepika looked like she was trying really really hard. Priyanka’s looks are more lowkey because she wanted to keep it lowkey. The Bollywood reception is tomorrow btw. Today was just a small one. Nothing about Priyanaka’s wedding was low key. Nothing at all. Whether she was able to make an impact with her looks or not was a different story. I think she looks lovely and contemporary. Its not very flashy but elegant especially the flowers and her confidence is her best accessory. He looks dapper and handsome, not OTT with his clothes. What is PC’s obsession with hair tendrils left on her face like that – it is SO dated. The outfit would not be my choice but she looks lovely ! Once again she has defied Sabysachi’s off-the-shelf styling ?????? I know a lot of people wont agree with me but this is a really tacky look. I dont understand the entire bollywood meets hollywood look that she is going for. First maangtikka, mangalsutra and bangles with a gown/dress and now a corset like lehenga? Why doesnt Nick wear dhoti with a leather jacket then? that way we can have hollywood meets bollywood. Agree. But honestly there is a very close green version of this banarasi outfit, which is a lehenga with a proper choli that someone else wore to their wedding and it didn’t look so tacky and try hard fusion. Yupp this outfit screams PC’s involvement to me. Cannot look past the bad hair :(. The corset top looks a bit tight- cannot get on board with this look at all. I had really high expectations given her wedding looks till date. Congrats to the newly wed.. guys even celebs shop from clearance rack..finally I can relate ;) but I won’t pick this outfit though. This wasn’t their main reception. Their Bollywood reception is tomorrow. People on this site overreact so much! They’re dressed simple because they wanted to keep it simple. They look good imo. There’s lots of better pics of them online. Just awful …. I can’t believe this is Sabya..
She knows she looks frumpy. That look says it all. How can it be this difficult to turn out half decent at your reception. How did Sabyasachi has lost the plot but he has some magic potion like the pied piper of Hamlin to lure these gorgeous women into this uninspiring look. If he can manage to make DP and Priyanka look this way then god save the world. PC’s bindi placement gives me OCD on so many levels! Yes.. forever… why does she wear her bindi so low?? It is meant to be on the forehead !! Oh man! There’s another reception?! How many receptions do people have? I actually didn’t mind this outfit. I thought Nick could’ve picked a better suit. The jewellery is just clashing so badly with this outfit. The lehenga per say while not extraordinary could’ve passed well had it been worn with simple gold toned jewellery. The hairstyle is terrible and ages her completely. A big fail. On an aside, Nick must be thinking ‘WTH did I marry into?’…this is one endless shadi celebration. Phew! I think even they are tired of their own wedding by now. Multiple weddings of their own, then immediately attending other weddings. The wedding fatigue is showing. Neither of them look like they were bothered to show up or are even enjoying themselves anymore. Oh My Gawd ! They are still getting married ?! I know I am very late but its actually bugging me for sometime now.Why did so many Bollywood folks went and got married this year ?! Especially women like PC and Sonam who have openly stated that they wanted a big wedding and wanted to feel like a princess and whatnot during their big day. I would expect such folks to get married at a time when not so many A-listers are getting married so that all the spotlights would be on them ? Is it because this year was the year of the Royal Wedding and so people just declared ‘I want a piece of that!’ to their partners ?! Although she looks beautiful, happy and in love…this outfit is SO BAD! I’m genuinely she walked out wearing it! You guys have problem about every single thing !! Weather someone is wearing Sabya … MM … Abu Jani or whatever !!! Everything on Priyanka looks bad and tacky head to toe.